Need a meal on the table in 30 minutes flat? I've got you covered! 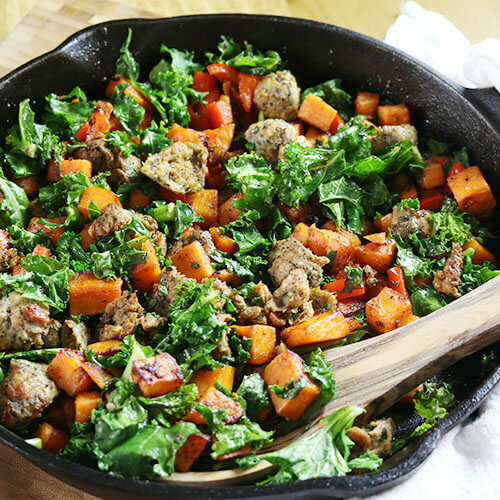 This Whole30 Sweet Potato Breakfast Hash is loaded with flavor and nutrition for an excellent, satisfying meal. Toss a fried egg on top for breakfast or serve it with a green salad for dinner… either way, it's delicious! The beauty of Whole30 recipes is that most of them are made entirely from scratch. They are nutrient-dense and filled with seasonal vegetables. 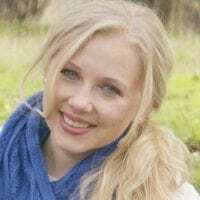 I also find that most Whole30 recipes are simple to make even for the novice cook. Take this breakfast hash, for example. It's a quick 30-minute, stovetop meal with protein and vegetables already on the same skillet. It's versatile enough that you can make it with any foods you have on hand! If you don't have breakfast or Italian sausage, use ground beef, pork, or chicken and add a tablespoon of Italian seasoning for some flavor. If you're out of sweet potatoes, use regular potatoes, or butternut squash. Instead of kale, feel free to throw in some chard or spinach. For a breakfast hash, I usually pre-cook my sweet potatoes in the Instant Pot (on a trivet, high pressure for 5 minutes) the evening prior. They cool overnight, so are easier to peel and dice. And since they're already cooked, we're just browning them on the skillet after the sausage has been cooked. This saves precious morning minutes. But even if you forgot to pre-cook the potatoes, no worries — this hash can still be finished in 30 minutes from start to finish. I just recommend to chop everything in small pieces to save time on cooking. The perfect blend of garlic, onion, and paprika take this hash to the next level. I love this trio for all things potatoes and it adds a great flavor to an otherwise simple hash. It also creates a nice “crust” on the potato cubes. Need a healthy meal on the table in 30 minutes flat? 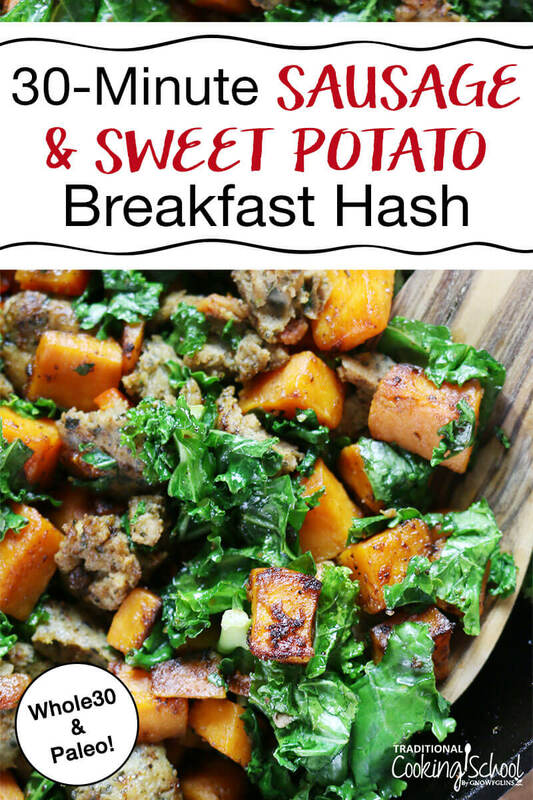 This Whole30 Sweet Potato Breakfast Hash has you covered! Loaded with seasonal veggies and sausage, baked in one easy skillet, topped with eggs and avocado... Does it get any better?! Serve it for breakfast or dinner, and enjoy this super simple yet delicious recipe! In a large cast iron skillet over medium-high heat, brown meat of choice in about 1 tablespoon ghee. If not using sausage, season with Italian seasoning. Remove meat from skillet. Leave drippings. Add 1 more tablespoon ghee. Add potatoes and season with garlic powder, onion powder, paprika, and salt. Stir. Cook potatoes until tender. If you'd like this step to go more quickly, make sure the potatoes are diced small! Add bell peppers. Stir to combine, continuing to cook for another minute. Transfer meat back into the skillet and stir. Add kale and season with salt. Cover the skillet to allow the kale to wilt for approximately 30 seconds. Uncover, remove from heat, and enjoy immediately. Top with a fried egg or eat as-is. What is your favorite way to enjoy Sweet Potato Breakfast Hash? With fried eggs or plain?